Firebird Studios is here to help your cafe or restaurant set itself apart with unique, hand made, individualised crockery and serving dishes. We also make ceramic travel mugs with your logo, silicone lid and grip ring, and in your colour range. As a production thrower, Lynda is able to easily make larger orders that conform to required volumes and other functional aspects. 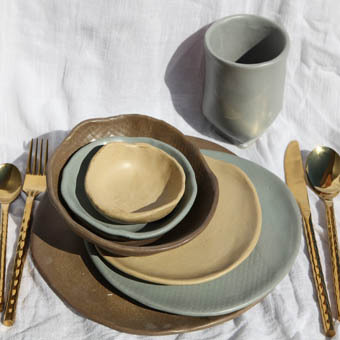 Since the work is hand made, it will retain slight changes in size and uniformity so that your customers know your serving ware is highly unique! If you want particularly large orders, such as for a national group, we can also slip cast and produce in larger numbers, still retaining the quirkiness and individuality as desired! 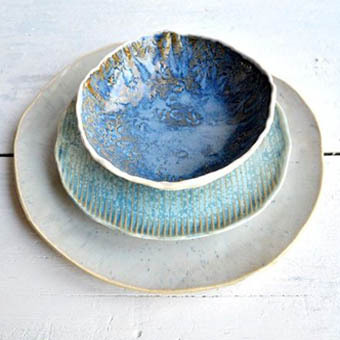 Stand out from the crowd and find out more about how Firebird Studios can help you get well priced and unique crockery and serving ware! Find out how Firebird Studios can help you get a totally unique and amazing look on your tables!